Following my conversion to folding bikes last year (see the Towsure review) I found myself in Halfords recently, picking up a Dahon Speed D7 in Midnight Blue. Eric Reed has covered all the other points on the very similar 2005 bike, so this is just an update. The 2007 D7's come with a telescopic handlebar stem and a new range of colours, mine is an 'old stock' 2006 bike in Midnight Blue; it came with mudguards, and an excellent rear carrier with a patent set of bungees that hook into it. There's a five year frame warranty. Halfords were pretty good at setting the bike up there and then, tightening the crankbolts and (over) adjusting the brakes and gears. This D7 has a pair of bottle carrier bosses on top of the frame too, but there's no integrated seat-tube air pump on my model which is either a disappointment or not, as presumably the pump adds a little to the weight. Wheels are 20” alloy. Folding the thing up is easy, align the left hand pedal crank to the front, unclip the handlebar release, rotate the bars upwards, drop the seat tube, fold the handlebar stem downwards, and then kind of bend the bike in half. 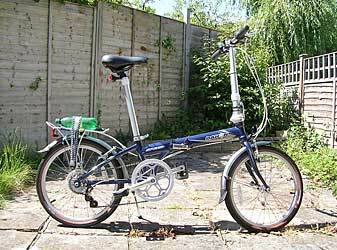 I haven't met the 15 second fold time specified on the Dahon web site, but thirty seconds should cover it. 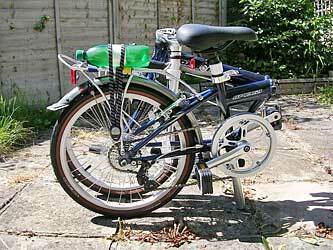 The bike weighs twelve kilos, but folds up into an easy to manage package for the car boot. Only seven gears? Yes, but the gearing is the work of a genius. First is sufficiently 'grannyfied' to get up most hills, seventh punts you along at a fine lick on a flat road, although you won't pick up a yellow jersey on this bike. The stock saddle appears to be gel-filled but rather manly; consequently ladies of a sensitive disposition may require a more accommodating design. The cantilever brakes are a big plus and give plenty of confidence on, er, steep downhill descents. The bike comes with alloy crank arms although the chain-wheel is slightly cheaper looking stamped steel, and a plastic guard on the chain wheel keeps your loon pants out of danger. The bottom bracket is a straightforward ball-bearing in cups design, easily serviceable for you round-the-world types, and there didn't appear to be much frame flex when attempting a modest sprint. Rear mech is an SR Suntour actuated by the grip-shift on the right hand bar. I like the 20" wheel designs, they seem to be a good compromise between portability and pot-hole management. The sit-up riding position is pretty good in town too, and the handlebars are easily replaceable if you fancy a change to something a little more sporty . So is this the folder for you? The price is reasonable, the bike is a delight to ride, and it makes a good commuter or pocket tourer. A modest pootle along an old railway line or tow path should also be possible. There's little to go wrong, and it's also a good looking folder. Some prefer the looks of the 2006 model, but you do get the adjustable handlebar stem on the 2007 model if you need it and dealers will occasionally throw in a carry bag too. The price was £299.00; discounts are available if you shop around, especially if you look for a 2006 bike. And there's that five-year frame warranty in the price, too.